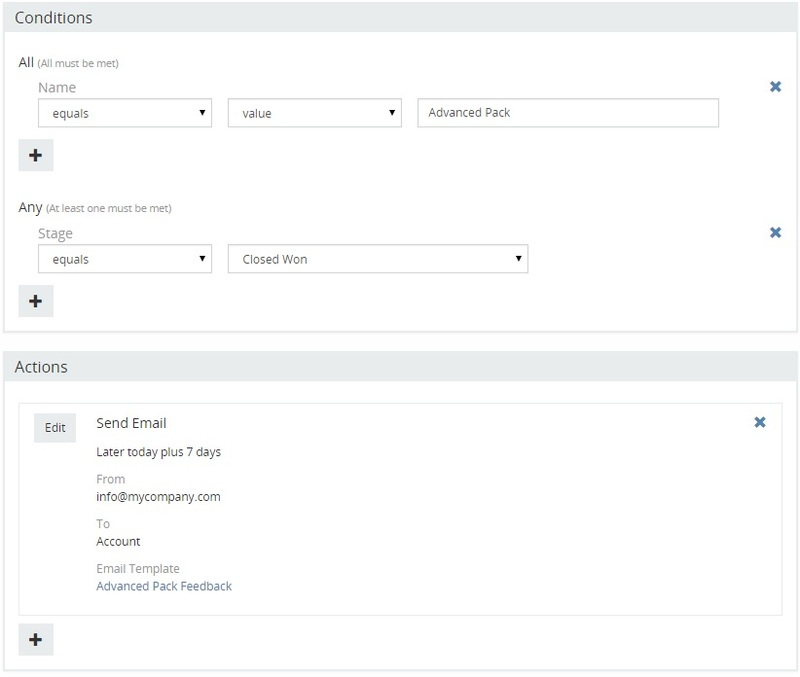 Workflows feature is available in Advanced Pack extension. Workflows automate your business processes an easy way. You can find it in the Administration panel. Define trigger type. After record created, After record saved, Scheduled. Define conditions. After record is saved and specified conditions get reached workflow process will be triggered. Define actions, which will be executed as workflow is processed. It’s possible to send email, create new record, update current record. After record created. Triggered only when a new record is created. If specified conditions are met then actions will be run. After record saved. Triggered when a new or existing record is saved. If specified conditions are met then actions will be run. Scheduled. Triggered according defined scheduling. You can setup it to run every day, every week, etc. Actions will be applied for records returned by specified list report. Sequential. Supposed to be run by another workflow. Provides an ability to make a complex logic. Send Email. System will send email using a specified email template. A recipient’s email address can be taken from the target record, any related record, the current user, or specified. Email can be sent immediately or delayed for a specific interval. Create Record. System will create the new record of any entity type. Create Related Record. System will create the record related to the target record. The records should be related by one-to-many or many-to-many link. Update Target Record. Change some fields of the target record. Update Related Record. Allows changing of specific fields of related record or records. Create Notification. Notify specified users or user related to the target entity with some message. Make Followed. System will force specific user(s) to follow the target record. Apply Assignment Rule. Round-Robin or Least-Busy distributions. Trigger Another Workflow. Allows to make sequential workflows. Allows to branch workflow. Run Service Action. Allows to run custom scripts. For more detail information how to utilize Workflows see documentation. Case 1. Customer purchase your product. After couple of days the system sends email to the customer with a few question regarding the product. Create workflow rule with trigger ‘After record created’ for Opportunity entity. Add needed conditions (like Stage equals ‘Closed Won’). Add Action ‘Send Email’, specify number of days when email must be sent, select Account as an recipient, select or create Email Template. You will be able to use Opportunity fields in a template. Case 2. When Lead gets converted create a Task for a manager. Create workflow rule with the trigger type ‘After record saved’ for Lead entity. Add Action ‘Create Related Entity’, select link Tasks and add all needed fields. Specify user the task should be assigned to. Case 3. Distribute cases created in portal among Support team members. User who has the least amount of open cases must be assigned. Create List Report that displays only open cases. For this add filter by the ‘Status’ field. Create workflow rule with the trigger type ‘After record created’ for Case entity.